Each December, there’s a bit of a lull in astronomy news. Not only do the holidays slow things down, but astronomers are also getting ready for the winter meeting of the American Astronomical Society (AAS) in January. These AAS meetings (there’s also a summer meeting in May or June) are a particularly high-profile place to announce a groundbreaking discovery or other exciting piece of research – scientists are surrounded by their peers, with press conferences held daily throughout the week-long meeting. We’ve covered a few of these meetings in the past – you can learn more about AAS press conferences, follow Maggie’s adventures at the 2011 AAS meeting in Seattle, or even listen to our podcast from a meeting in 2010. This year’s AAS winter meeting was held in Long Beach, CA, where astronomers got a bit of sunshine and sand as well as time to meet with their colleagues, present their research, and hear about the latest and greatest astronomy news. We wanted to share some of the highlights from the astrophysics press releases – and there are some particularly exciting ones in this meeting’s batch! From a “zombie” to a “rogue” – the astronomy community still can’t get enough of the strange planet Fomalhaut b! First, there was controversy over whether it was a planet or a dust cloud, and now they’re looking at the planet’s unusual orbit within the debris disk of its host star, Fomalhaut. The planet’s highly elliptical, 2,000-year orbit leads astronomers to suspect that there may be other planet-like bodies hiding within the debris around Fomalhaut. One or more of these other bodies may have gravitationally disturbed Fomalhaut b, ejecting it from a position closer to the star and sending it on a wild and potentially destructive orbit through the debris disk. 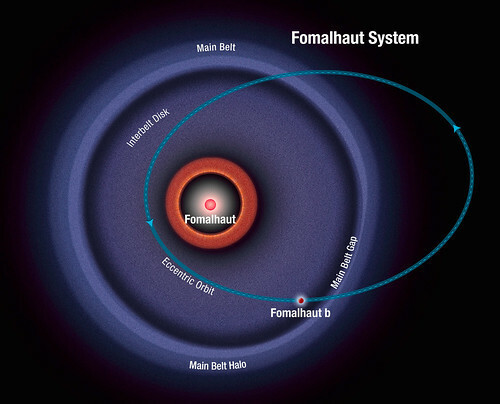 I’m sure this isn’t the last we’ve heard about Fomalhaut b, as astronomers are hoping to continue the hunt for other planets in its system, and to better understand its own characteristics. After NuSTAR launched last year, we interviewed Dr. Dan Wik about the exciting science the mission would do. 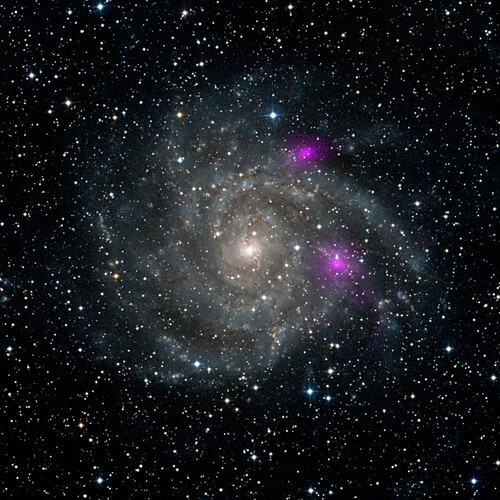 The satellite recently turned its X-ray eyes to study a strange and fascinating phenomenon in spiral galaxy IC 342 – two ultra-luminous black holes are entangled in the galaxy’s sweeping arms (and highlighted in magenta in the image above, which merges NuSTAR data with a visible light image of the galaxy from the Digitized Sky Survey). Scientists are keen to understand the properties of these black holes, what keeps them in the galaxy’s arms, and why they are unusually bright. NuSTAR also released a lovely new view of supernova remnant Cassiopeia A at the AAS meeting. Credit: NASA/SOFIA/FORCAST team/Lau et al. 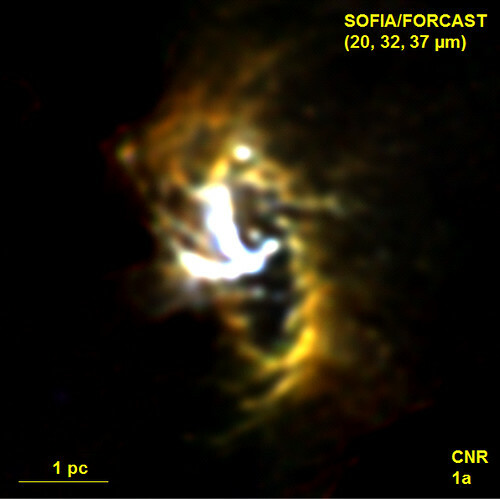 Bringing things much closer to home, SOFIA’s observations of the center of our own Milky Way galaxy have given astronomers a new view of the ring of gas and dust surrounding the supermassive black hole at the galaxy’s core. The image above shows the ring, with the bright Y-shaped region showing material falling from the ring toward the black hole (located where the arms of the Y intersect). But the center of the galaxy isn’t just home to a huge black hole – SOFIA has also spotted a cluster of bright young stars growing up in dust cocoons just 100 light years away from it. Astronomers are interested in the possible connection between supermassive black holes and star formation at the centers of galaxies, which has been observed in other galaxies besides our own. Brown dwarfs are like stars that never got going – they form out of condensing gas, just like stars do, but don’t have enough mass to start fusing hydrogen and producing energy. As a result, they end up having more in common with gas giant planets, including swirling atmospheres and complex weather patterns. 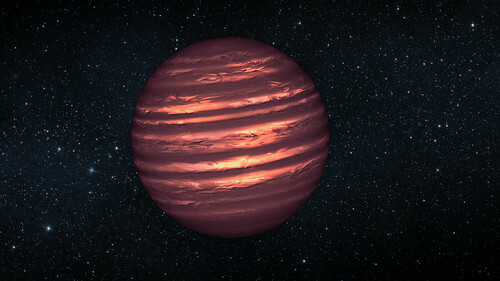 The artist’s conception above depicts the atmosphere of brown dwarf 2MASSJ22282889-431026 (what a name! ), with distinct bands of weather and windy storms the size of Earth. New research harnesses observations by both Hubble and Spitzer, studying the weather in multiple atmospheric layers of 2MASSJ22282889-431026 as the first of many brown dwarfs to be observed through simultaneous observations by both satellites. The techniques being used to study these objects could also be useful in the future study of exoplanets. The next meeting of the American Astronomical Society will be held in June in Indianapolis, and will almost certainly bring another busy week of press releases!